As sustainable development is put into operation in our society and industry, there emerges the need to understand the pertinent key indicators and how they can be measured to determine if progress is made. The ability to measure sustainability becomes even more crucial - as the business adage of "only what gets measured gets managed" suggests - as we make decisions and navigate towards the sustain-ability development goals. Efforts to develop sustainability indicators and metrics have been made at various scales, ranging from global down to local community, business unit, and technology levels. In general, indicators and metrics are designed to capture the ideas inherent in sustainability and transform them into a manageable set of quantitative measures and indices that are useful for communication and decision-making. in this section, we provide an overview of sustainability indicators and metrics, especially as they relate to the chemical industry. This section will be followed by two specific case studies on the uses of sustainability metrics and indicators in product/process development in chemical companies. Regarding nomenclature, the terms "indicators" and "metrics" are both commonly used, often interchangeably, in referring to measurement of sustainability. "Indicators," however, are typically used more broadly, encompassing both quantitative measurements and narrative descriptions of issues of importance as well as, in certain cases, the key aspects that needs to be managed. The term "metrics," on the other hand, is used almost solely in referring to quantitative or semi-quantitative measurements or indices. 6.1.1.1 Framing Sustainability Indicators and Metrics. Since the "Earth Summit" in 1992, there has been a global consensus that sustainable development encompasses at least economic growth, social progress, and stewardship of the environment. As these so-called three pillars or dimensions of sustainable development have long been separately managed, the significance of the concept lays primarily in the integration of the various concerns. Various metrics within each of the three dimensions of sustainability have long been well developed and used. Gross domestic product (GDP) per capita, literacy and poverty rates, and ambient concentration of urban air pollutants are some examples of economic, social, and environmental metrics employed at the national level. In businesses, financial metrics such as return on investment as well as certain metrics that reflect employee well-being and environmental performance, such as health and safety incident rates and regulated toxic releases, are also conventionally used. Sustainable development, however, requires further cross-functional integration of these metrics as well as the inclusion of additional metrics that facilitate more systemic and comprehensive multidisciplinary communication and thinking. • Eco-efficiency considerations, that is, the generation of greater (economic) value using fewer natural resources and with less environmental impact. Figure 6.1. 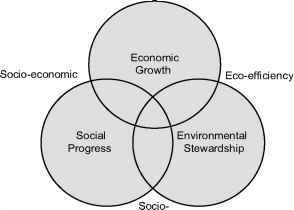 Socio-economic, socio-environmental, and eco-efficiency considerations at the intersections of the triple dimensions of sustainability. and services in satisfying human needs and improving people's livelihoods; (b) the reduction of public health and safety concerns associated with environmental impacts; and (c) the more equitable use of natural resources enabled by their more efficient uses. Global and National Metrics. To effectively support decision-making, indicators and metrics must be linked to key goals of an organization and important aspects that need to be managed. Global agreements, such as Agenda 21 and the more recent Millennium Development Goals, both developed under the umbrella of the United Nations, are eminent foundations for identifying the important aspects of sustainability. Agenda 21, adopted by over 178 nations at the 1992 Earth Summit in Rio de Janeiro, calls for actions to address disparities in social and economic development among and within nations, especially in terms of poverty, hunger, adequate housing, and public health, as well as education and institutional capacity. In addition, it recognizes the need for social and economic development to be accompanied by the conservation and management of natural resources in terms of protecting the atmosphere, forests, fragile ecosystems, oceans, and freshwater resources, managing land use and releases of wastes and toxic chemicals, and conserving biodiversity. Furthermore, additional issues such as energy, material use, transportation, and global climate change have gained attention in the dozen years since. Many of these aspects have been translated into indicators and metrics, such as those compiled by the United Nations Commission for Sustainable Development (UNCSD, 2001). National governments may adopt these indicators and metrics and adapt them to their needs in order to track, manage, and report on their countries' progress in sustainable development. Some useful proxy indices of sustainability have also been proposed in the literature. One example is the "ecological footprint accounts" developed by Dr. Mathis Wackernagel and co-workers at the Ecological Footprint Network, which aggregate the ecological impacts of human economic activities in terms of "biologically productive land and water required to produce the resources consumed and to assimilate the waste generated by humanity" (Wackernagel et al., 2002). Recent data on the ecological footprint account for countries with the world's largest economies, and populations are shown in Table 6.1. Biologically productive land and water areas used and impacted by agriculture and herding, forestry, fishing, infrastructure, and the burning of fossil fuels are included in the index. While far from providing the entire picture of sustainability, the calculations effectively highlight how many countries, both developed and developing, have overshot their ecological capacities. The issue of equity in the use of natural resources is also evident. Developed countries such as the united states, for example, use more than four times the world's average in global acres per person. Details on the calculation of ecological footprint accounts are available elsewhere (Loh and Wackernagel, 2004). aProvided by Dr. Mathis Wackernagel, Ecological Footprint Network (www.footprintnetwork.org). Numbers may not always add up due to rounding. Note that Ecological footprint results are based on 1999 data, since consumption data reporting has a longer time lag. However, Ecological footprint numbers only change slowly over time. section will focus on sustainability indicators and metrics used by companies in tracking and managing their performance and in assessing different technologies. A list of important aspects of sustainability shown in Chapter 4 (Table 4.1) offers a starting point for companies to identify important aspects that need to be considered in developing sustainability indicators and metrics. By necessity, this list will differ somewhat among companies and organizations. How aspects of sustain-ability are prioritized in terms of importance is a function of many factors, including differences in types of business, operational conditions, history, community issues, and other aspects specific to a company or an organization. Generally, resource use and waste, monetary costs and benefits internal and external to the company, and well-being of people in the workplace and in the community affected by the company's operations are the environmental, economic, and social aspects relevant to most companies. In addition, the company's strategy in managing sustainability is of foremost importance in ensuring the company's satisfactory performance in all aspects of sustainability. Leading versus Lagging. Effective management of sustainability in an organization requires the use of both lagging and leading indicators and metrics. A lagging metric is reported after an impact has occurred, and reflects past (including recent) outcomes in relation to the organization's performance goals. Leading metrics and indicators, on the other hand, assess activities that occur prior to the impact and affect the future performance of the organization, usually identified through a cause-and-effect analysis. Operational metrics that quantify a company's environmental, health, and safety (EHS) and sustainability performance are usually considered lagging. In contrast, management metrics, which include the characterization of a company's EHS and sustainability management system, are commonly regarded as leading metrics. Examples of management metrics include the number of audits performed and the incorporation of global EHS and sustainability management standards. However, as pointed out by Epstein and Wisner (2001), leading and lagging are relative terms in a continuum of cause and effect relationships. For instance, incorporation of an environmental management system is a leading indicator of environmental performance, which in turn can be leading indicators of a company's reputation, employee morale, and financial performance. Thus, both types are important for a company in navigating toward sustainable development. Much of the efforts to date in developing sustainability metrics, however, have focused on measuring the operational dimensions of sustainability. 6.1.1.2 Development of Sustainability Metrics in the Chemical and Manufacturing Industry. Efforts have been made to develop sustainability metrics for various purposes and industry sectors, such as urban planning (e.g., Shane and Graedel, 2000), green building (e.g., Olgay and Herdt, 2004), and sustainable tourism (e.g., Hughes, 2002; Li, 2004). Manufacturing companies, including chemical manufacturers, have also kept track of the various elements that make up sustain-ability metrics. This includes resource uses that carry economic costs as well as emissions and wastes, as mandated by regulation. Over the past decade, the industry has also begun to view their resource consumption and environmental release data in terms of broader sustainability. • Level 5 - Sustainability metrics, which further extend the scope to cover long-term issues such as material depletion and the use of renewable resources. Further integration with social and economic dimensions of sustainability is also commonly considered a criterion of sustainability metrics. As compliance has historically been a primary driver, conventional EHS metrics typically focus on compliance-driven Level 1 metrics. While ensuring conformance with laws and regulations, these metrics offer little business competitive advantage to companies implementing them. Level 2 to Level 5 metrics, on the other hand, begin to address efficiency and value generation while minimizing undesirable impacts and related costs to the company, the community, and the environment. Early work in this evolution toward sustainability metrics includes the development of eco-efficiency metrics by Canada's National Round Table on the Environment and the Economy (NRTEE, 1999) and World Business Council for Sustainable Development (WBCSD) (Verfaillie and Bidwell, 2000). Supported by participation from their member companies, the organizations recommended eco-efficiency measurements that are defined as ratios, with resource use and environmental impacts in the numerators, and value generation in the denominator, or vice versa. projects/sustain.htm). In collaboration with BRIDGES to Sustainability, a nonprofit group based in Houston, heuristics and decision rules were developed and tested in industry pilots and for over 50 chemical processes based on the respected Process Economic Program (PEP) data from SRI International (Menlo Park, CA) (Schwarz et al., 2000, 2002). Effort to develop sustainability metrics was also undertaken by Britain's Institution of Chemical Engineers (IChemE, 2002), which resulted in an expanded set that includes economic and societal metrics in addition to those focused on eco-efficiency. While development of these metrics sets typically began by focusing primarily on the amounts of material and energy flows, measures of potential impacts, such as toxicity potential, were soon recognized as more meaningful and rigorous than simple quantity measures, and thus became part of standard metrics. Extensions to supply chain, lifecycle, and broader sustainability considerations, however, have been more limited, especially in progress tracking and management decision-making, where such data are more difficult to obtain relative to the company's own resource use and environmental release data. Nevertheless, these more extensive sustainability considerations are increasingly applied in assessing products and processes during research and development (R&D). Corporate case studies highlighted in Sections 6.1.2 and 6.1.3 provide such examples. • protective of proprietary information. 6.1.1.3 Defining the Metrics: Eco-efficiency. As described earlier, the development of sustainability metrics requires one to first identify the key aspects that need to be managed and included in the metrics. Equally important, however, one must define how the metric is calculated. For example, when expressed as a ratio, one must identify aspects that are to be included in the numerator and in the denominator. Furthermore, one must decide how the metric is bounded (e.g., which supporting processes are included) and any heuristics and decision-rules to be used in the calculation. 1. Material consumption. The use of materials, especially nonrenewable and finite resources, affects the availability of the resources and results in environmental degradation both in the extraction of the materials and when they are converted to wastes. 2. Energy consumption. In addition to being another important area of resource use and availability, energy use results in various environmental impacts. The burning of fossil fuels, specifically, relates to impacts such as global warming, photochemical ozone oxidation, and acidification. Renewable energy, such as hydropower, relates to a different set of impacts. 3. Water consumption. Freshwater is essential to life and almost all economic activities. With increasing anthropogenic demands and shortage in many water-stressed parts of the world, water consumption becomes an increasingly important consideration. 4. Toxics and pollutants. Toxics and other pollutants released in the forms of air emissions and wastewater effluents may result in damages to human health and the environment, and financial liability to pollutant sources. 5. 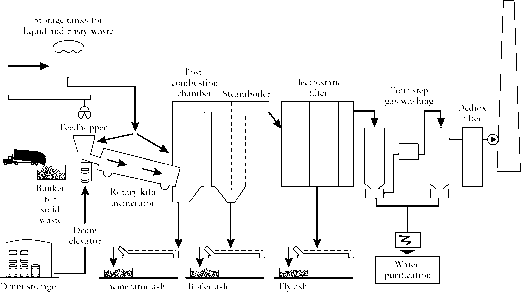 Solid wastes. Reducing solid wastes is important for certain industries, especially in regions with no or very limited landfill capacity, such as Europe, Japan, and northeastern United States. 6. Land use. Land is another finite resource that provides a variety of ecological and socioeconomic services. Basic Eco-Efficiency Metrics. The above eco-efficiency categories can be captured by a small number of metrics. For illustration, let us consider the set of "basic metrics" adopted by BRIDGES to Sustainability (Schwarz et al., 2000, 2002), shown in Table 6.2. Informed by the work of NRTEE (1999) and WBCSD (Verfaillie and Bidwell, 2000), the metrics were chosen as ratios. Impacts are placed in the numerators and a measure of output is in the denominator. The denominator can be mass or other unit of product, functional unit, sales revenue, monetary value-added, or a certain measure of societal benefits. Expressing the metrics as ratios allow them to be compared and used in weighing decision alternatives and comparing operational units. Defined in this manner, the lower metrics are better as they reflect lower impacts per unit of value generation.